The Visonic MCS-740 alarm siren comes fitted with two ER18505M lithium battery packs. 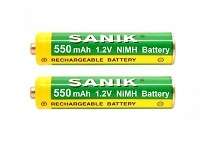 This model is 3.5Ah which lasts 2-3yrs in normal operation and is not rechargeable. The MCS-740 and SR-740 PG2 must have 2 battery packs installed.